Lily Mazurek is often called "The Mandala Lady"
A natural mystic and intuitive, Lily Mazurek’s path toward healing was shaped through several life-changing experiences. As a child living in upstate New York, she had a near-death experience. She went through the proverbial “tunnel”, but was returned to grow up and continue her work here. As a young adult in college, perplexed about what to do with her life, she received a message while in a meditative state, that she was to be a “healer of souls”. At the time she had no idea what this meant or what shape her mission would take. In 1995-6, Ms. Mazurek went through her “dark night of the soul”. In a span of six months, she had a car accident, lost her job, lost her father to colon cancer, was going through a divorce, and endured a bout with breast cancer and radiation therapy. Like many who become “wounded healers” she faced these difficulties and critical illness and recovered, with a chance to serve others. She discovered her way through Mandalas. She found Mandala work to be extremely effective in helping to heal emotional and physical pain as well as in self-transformation, re-centering life, and regaining wholeness. 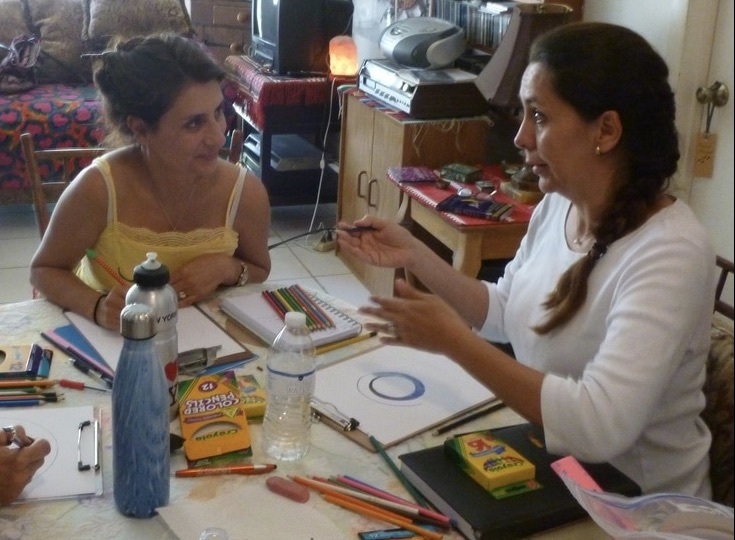 “To this day I continue to learn from mandalas,” she says. Through the feedback of friends and many associates over the years, Ms. Mazurek learned of the ways in which she had affected them and saw that there was a distinct pattern to the role she played in their healing and in their lives. Although this role is sometimes challenging, she feels gratitude in knowing the specific way she is being used by God to help and serve others on their path. Ms. Mazurek has experienced numerous spiritual and metaphysical events including spontaneous healings and physical manifestations. In January of 2000, she was with family in Hong Kong, recuperating from three physical ailments—a respiratory infection, a kidney stone, and a painful back injury—and was barely able to walk. She was visited by a Buddha figure in a dream and told, among other things, that it was “not time to trade in your vehicle”. The loving figure kissed her and she fell asleep. The next morning all three ailments had disappeared and she felt a sense of wholeness, completion, and joy. In 2005, just days after receiving her Reiki II attunement, Ms. Mazurek experienced 10 days of what can only be called enlightenment, or a little bit of heaven on earth. Her body was in a high-vibrational state--literally vibrating at a higher frequency--that was, as she described it, “both exhausting and exhilarating at the same time”. Water did not feel wet…and she saw and experienced the shimmering, energetic web of love that connects us all. She was continually filled with an inexpressible bliss and carried what Taoists call the “inner smile”. Through her Mandala Workshops, Ms. Mazurek hopes to help others understand the profound significance and message of Mandalas in order to find a similar, enlightening and higher states of experience for themselves. Ms. Mazurek has also experienced other spontaneous, heightened states of consciousness, some lasting as long as 6 weeks. As she understands and masters spiritual vibration and energy, her own vibration is rising. Lily Mazurek is the originator of Mandala Workshops in Florida, which evolved as she healed herself from breast cancer. At the time she began her practice in 1996, no one else was teaching or practicing Mandalas in Florida, and across the country only Judith Cornell was involved in Mandalas. A gifted teacher and public speaker, Ms. Mazurek conducts Workshops, for adults, teens and children. The settings for these workshops encompass universities, schools, churches, oncology and AIDS conferences, cancer centers, metaphysical centers, libraries and private sessions with groups and individuals. Her workshops are part of the Arts in Education program for Broward County and the Business for the Arts Program of Broward County. She is also in the process of developing an online correspondence course via internet due to popular demand. Ms. Mazurek conducts seminars in Public Speaking, Journaling, Boosting Your Immune System, Earthworks, and Art Appreciation. Given her belief in the healing power of the arts, it is no surprise that she managed a performing arts center in Florida for nearly two decades and is a published free-lance writer and artist. Her love of nature is expressed in gardening, growing herbs and flowers, raising butterflies, and finding the ever-present Mandala. She has two book manuscripts in the works. One focuses on what she has learned about the message of the Mandala, which should be published in 2018. The other is a spiritual memoir that deals with the energetic and spiritual connections between us all. ​Updates to Lily's work are posted to our Facebook page. Please join and LIKE our page on Facebook, by clicking The Mandala Message, or click on the icon at the top of this page. ​and psychodrama and sociotherapy at the New School for Social Research. She also holds a professional certificate in acting from the American Academy of Dramatic Arts in New York City. Ms. Mazurek has been a student of metaphysics, quantum physics, psychology, spirituality, and the arts her whole life. She is a medical intuitive, and a trained practitioner of Reiki, the EFT meridian tapping technique, Shamanic Healing, and Herbal Medicine. Ms. Mazurek participated in specialized, all-day intensive seminars in Miami under the 14th Dalai Lama, as well as under Japanese scientist, Dr. Masaru Emoto. From his holiness, the Dalai Lama, she learned about the complex Buddhist teachings of Dharma and the importance of training our mind in order to control negative emotions. She found his composure, compassion, and humorous good nature to be wonderfully impressive and inspiring. ​and findings with them each time she has new information. “Education is an ongoing process throughout our lives,” she says.